Along the same lines as Group 10’s work on Analytics, I came across an interesting article I thought I’d share from Canadian Business. It relates to data privacy and analytics as this was brought up as one of the numerous challenges broached when using any form of analytics. From the discussion within Group 10s OER, for many of us the misuse of analytics was predominant but there were a few of us who were also concerned about privacy and ethical concerns. 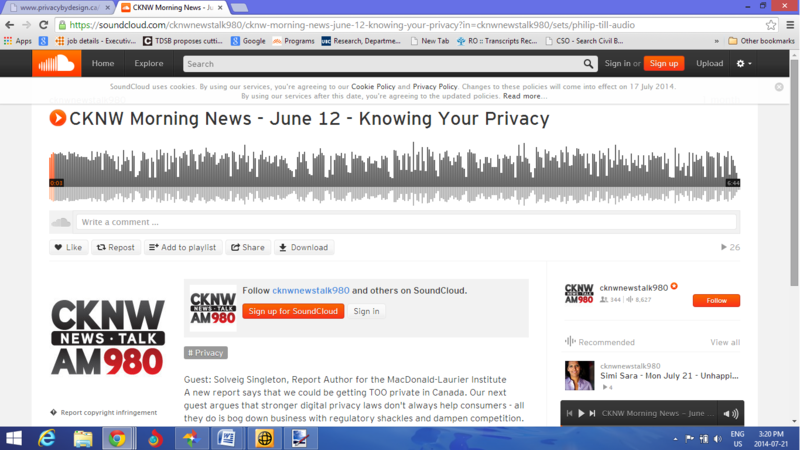 I found this article interesting in that the Ontario Commissioner on Privacy, Ann Cavoukian, stated her belief that “privacy controls and innovation can coexist. 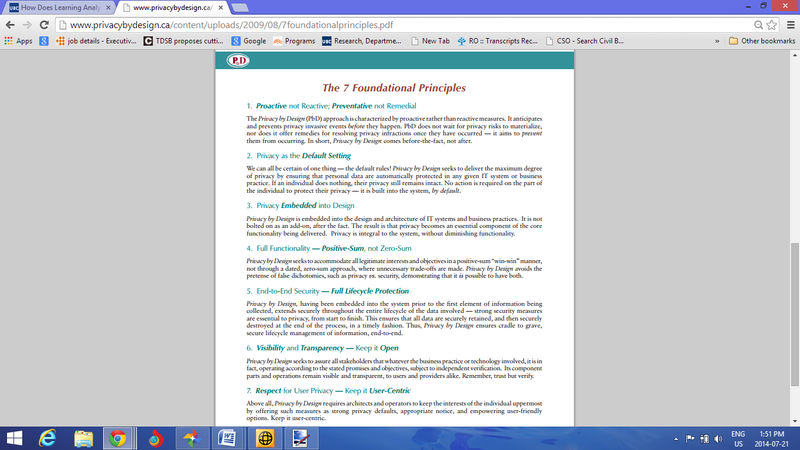 “Privacy has enormous value at both the societal level and at the individual level. It forms the basis of our freedoms and allows creativity and innovation to thrive,”. She stressed the importance of not just amassing data but having “good data” which is quite important when analyzing any form of analytics. She also states that privacy issues should be a” business issue and not a compliance issue” to help foster innovation. I wonder how this would be addressed if this becomes the case in the future, then consumer’s data privacy may then become too lax. I will post a differing viewpoint that I found above as there was another article pinpointing this exact point. 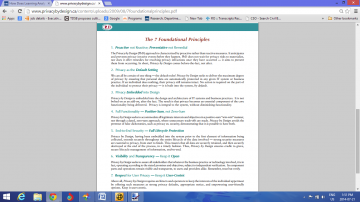 She outlines in her paper, seven foundational laws of privacy that businesses should then follow to help foster innovation. 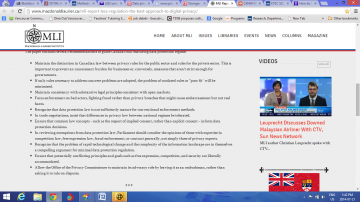 The second link is to her paper, the first is the article in Canadian Business. 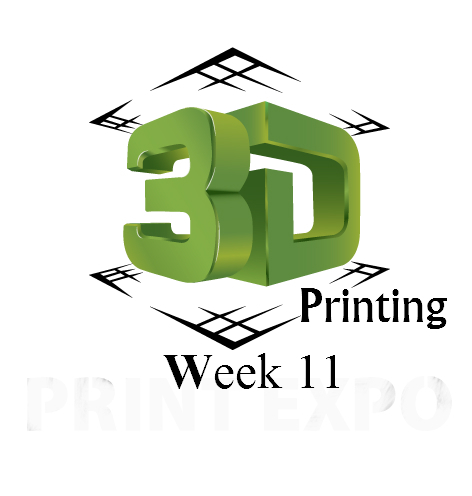 Week 10 you did a wonderful job explaining analytics in education in a simple and concise manner. Not an easy task! I really liked the way the your site seemed to intuitively answer the questions I had about the topic as I went through the OER. The delivery was so thought provoking it left me reflecting on the subject of data and epistemological variance. I can’t help but walk away with some concerns about the future of this area. I think that the primary concern is in the contradiction and interpretation of the data. I understand that analytics really is providing basis for a statistical mean understanding of what is happening with regards to making decisions about the next direction to take. Relying so heavily on statistical approaches and analytics systems could create an educational landscape where we have a new ideology of how to define the ‘perfect student’. That is to perpetuate one type of educational belief and or opinion(s) onto society as whole and potentially create an A standard that is one dimensional because of wealth of data driven educational ideologies. This isn’t to say that learning analytics shouldn’t be used, but there should by multiple views and perspectives that are chosen to drive data forward. The problem inside the technology space is that data in various fields is often controlled by one or two major players. If this happens to education, we could face fundamental problems with data analytic theory and epistemological views on education. Hi Group 10 – Great overall presentation with Learning Analytics, the navigation and layout of the website were excellent, and managed to find all the required resources as necessary. The question that really interested me, and attempted to use your resources to answer included understanding technological learning and IT integration in teacher education. Recently the Ontario Government mandated 2 year teacher college programs and the big thing was that they were focusing on providing “tech” learning during the second year. I am so curious as to understand what this tech learning is about, and if teachers will actually benefit from this second year. Understandably, there are other reasons for extending the program, but IT and teaching technology correctly with adequate training programs needs to be measured somehow. For instance, will the teachers be measured on their use of internet, and research, or perhaps they should be measured on how often they create, implement, and deliver a web-based solution, such as website creation, online resource formation, wiki entries, and other important tasks. Will teachers be able to provide the right knowledge to students, or will they simply sit them in front of computers and say, “Now Kids, off you go!?”. In respects to this, some of your products, such as the Panorama Advanced Analytics tool is perfect for this measurement, and educators need to adapt this technology for this kind of measurement. There are some issues with Performance-based analytics, including understanding the true measurement of student achievement, and if indicators suggest that students are performing well, does that relate to a naturally talented group who understands technology or does that relate to how well the teacher can teach and train the students on using the software. There are many considerations to take into account; however analysis of learning is only the beginning. I think that this tool would help weed out the bad teachers from the good, and those who are just there for being there. The tools are important for teachers delivering online courses, and understanding how often students log-in and contribute, but it doesn’t measure, quality of content, and perhaps what the students do when they log in! Haven’t you noticed that some Facebook users are always logged-in but they never actually participate in conversation! Another potential problem! Great job! Thank you for helping me learn about learning analytics, and surprisingly it was applicable at my job this week as I learned about an analytics company that we and many school districts use to monitor employees on call for all areas of a school board. This lets school boards know if they need to hire more employees and in what areas. I thought it was so interesting and timely. I thought your OER was very professional looking and one of the most striking things to me was how organized it was. I thought that you made a good use of the physical space of your webpage with proper headings, bullet points, videos and icons. I really found it easy to navigate. I also feel that it was concise with not too much information per page. It was separated into manageable chunks and I appreciated this. The discussion activities were great too – it is always nice to have choice and I made use of the checklist because I had (somehow) missed an activity when I first went through the class. Unfortunately (but fortunately) I really don’t have any suggestions! Found this really interesting infographic on Smartphone Apps and their integration into education. Thought this was especially relevant since we are now moving into using IPads into the classroom, mobile apps for Game based learning and numerous other apps that can be used with an educational spin or relevance. With the growing number of uses of Apps we are moving towards helping our students use Apps for educational purposes. It is interesting to note that only in 2012, within the U.S. more than 25 million apps were downloaded so within the time frame of two additional years the growth in that number would be exponential. There is also a growing number of students who use apps to study and learn curriculum material via their smartphones. This also lends to the idea of medical schools now using apps within their curriculum and related to cloud based learning that group 9 addressed with their project in relation to medical relevancy. I subscribe to the mailing list with Edweb and almost every day they send out free webinars for teachers. I have done a few webinars and they range in content but they have all been interesting. Edweb is also a community for teachers so if you are interested in building or creating your personal learning network (PLN), Edweb is a good place to start. The website is american and follows the Common Core but it is very good and easy to use. Mathcraft is a webinar that is taking place July 17th, you can sign up on the link and it is free. The teacher who is presenting has been using Minecraft in his classroom and has seen math proficiency go from 18% to 83%. I really appreciated how you used Edmodo , Twitter and Socrative to deliver your OER. If you want people to reflect on social media, you have to engage them in using it. You exposed us to several platforms and encouraged us to use them and review them. I had signed up for Edmodo a year ago with the intention of exploring its affordances for use in my classroom and never went any further with it after discovering that it was hosted in the United States and this would be a FIPPA issue. 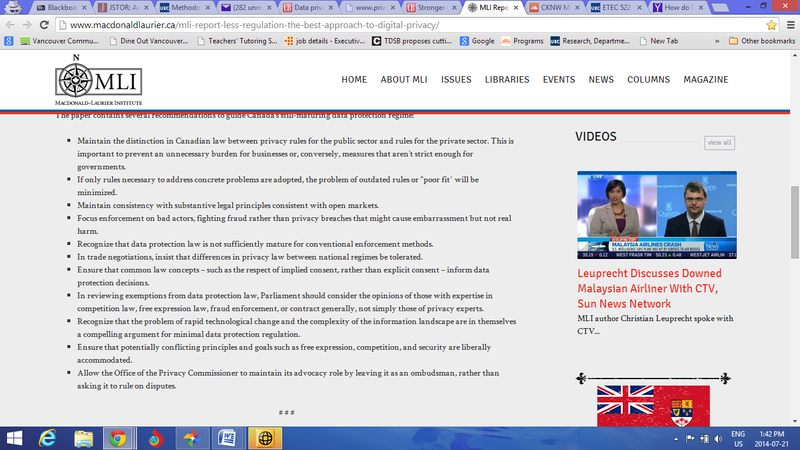 While I love that you immersed us in the media for your OER, there was a lot of scrolling to the bottom of the page. I was disappointed when I clicked on Assignments and there was nothing there. I was hoping for better content curation but this is more a review Edmodo as a platform rather than your content. I am wondering if you will you be able to submit to NMH as an OER if Edmodo requires a sign in? You had great, visual content that helped propel the discussions and nothing was too overwhelming or time consuming, which I deeply appreciated. I was quickly and easily engaged in your content which expanded the field of social media as it pertains to education. I thought the way you employed the affordances of Twitter for your activity was a great example of how to use this tool for education. In short, you walked the walk and talked the talk. Thanks for an engaging week. Thank you so much for participating in Week 8! Despite a few cloud collaboration challenges, there were some good discussions, ideas and tools generated throughout the week. We appreciate your feedback and have incorporated many of the suggestions to improve our OER. Please check out our Precis for the wrap up and reflection. I thought it was interesting and fitting that you chose to focus on cloud-based learning in the medical field. The melding of education and healthcare is a fast-growing trend. An example is the MEd in Health Sciences Education program at the U of Alberta that was developed collaboratively between the education and health science faculties to address the needs of health professionals and medical faculty to enhance their teaching and educational research skills. Exposure to new technologies used in teaching, research and practice, like simulations, digital media in health care, and cloud learning environments are very important indeed. I enjoyed using Mural.ly even though I found that it had its limitations. It was great for brainstorming, but less ideal for more involved group discussions. I was not aware of so many cloud-based tools until I participated in your group survey and would love to check out some of them. Excellent work – thanks! You had a very interesting topic and your webpage was laid out neatly and was easy to navigate. There was a lot of information to absorb on your topic, and as most of us are not in this field, it was a little difficult to process it all. I liked the idea of having all of the groups work together to create something, but like some others have mentioned, it was a little difficult to connect with everyone through the week to get ours completed. Maybe a heads up about group work would have been more effective. I thought it was a great idea to introduce different platforms to use to create the final piece. I found that our moderator for the collaborative piece was excellent and made sure that we were on track. That was an excellent idea. All in all, a great piece of work group 8. The digital content market surged 30 percent between 2012 and 2013, with apps driving much of the growth, according to a report from IHS and App Annie. The joint research study also looked across digital games, music and movies. Overall consumer spending on mobile apps jumped 2.3x year-over-year. 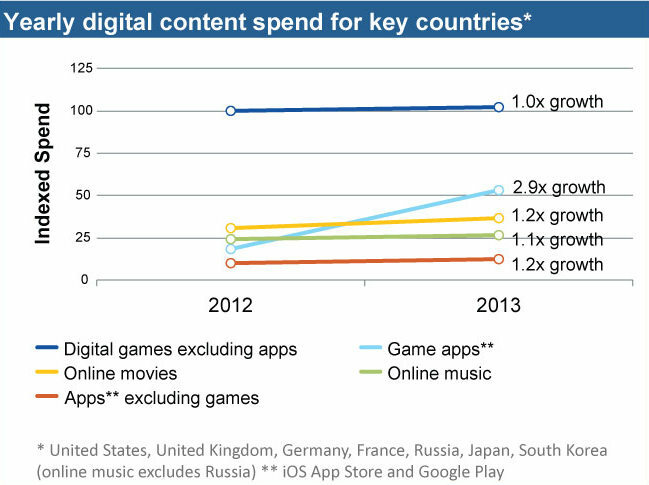 Consumer spending on gaming apps grew 2.9x from 2012 to 2013 and game apps are driving overall digital games growth. Large gains in game app spend emerged in Japan and South Korea, with 4.4x and 5.8x growth year-over-year, respectively. Apps are now the leading content category in Japan and could overtake digital games, excluding apps in South Korea, in the coming years, the report said. Music apps also saw significant growth, with consumer spend rising 77 percent from 2012 to 2013. Mobile gaming spend more than doubled over 2013, with growth particularly strong in Asia, according to the IHS and App Annie study. Though monetization is always a challenge for developers, the report shows that apps may stand a greater chance of finding revenue if they are less focused on replicating content services like Netflix or Spotify and offering complementary content instead. For example, the report notes the growing popularity of games that tie in to blockbuster movies, or discovery services, which have proven particularly successful in the digital music space. In many respects, the report said, the role of apps is not merely delivering content like music or movies but helping to build the audience for it. This report is another proof of importance of supporting code education for the future digital content market growth. If indie developers ever feel a little lonely working on mobile apps and games, they should know they’re part of a worldwide group that numbers 8.7 million people, according to Evans Data. The Santa Cruz, Calif.-based firm recently released its Worldwide Developer Population and Demographics Study, which culls data from the World Bank data center, CIA World Factbook, the U.S. Census and several other sources. In total, there are 19 million software developers in the world, which means about 50 percent of them are now focused on creating apps for mobile devices. 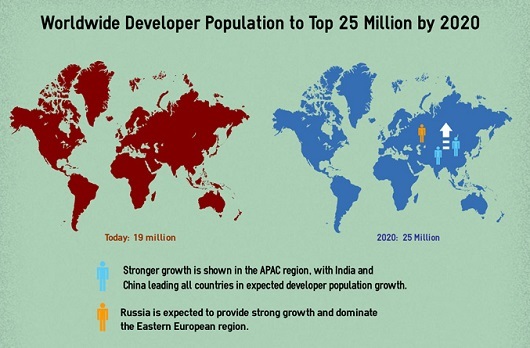 The worldwide developer population has essentially doubled since 2010, with an increase of 700,000 in the last year. Asia-Pacific region leads in mobile dev growth with about 46 percent more developers focused on mobile than the Europe, Middle East and Africa (EMEA) region. The number of female developers has boomed by 87 percent since 2001, totaling nearly 3.5 million developers today. Evans Data estimates a worldwide developer population of 25 million by 2020. The research firm projects the worldwide software developer population to grow from 19 million today to 25 million by 2020. It’s no surprise that many developers are focusing on business apps, particularly if they come from a more traditional software development background compared with the hobbyists or those who see creating consumer apps as a sideline. What might be more difficult to track–but what would be quite valuable–is what proportion of those who start out as consumer app and mobile game makers shift into the enterprise side. Although Evans is offering the big picture around developer demographics, the details around those who are employed by big firms vs. those who are entrepreneurs–and those who see this as a profession versus those who are doing it for the love–is incredibly complex. Those providing the best developer tools, cloud-based or otherwise, are probably not targeting that 8.7 million as a whole, but looking at specific niches. As for consumers, they probably don’t care a lot about developer demographics. They just want their apps to work–and to be fun. This report and article perfectly supports our W07-Opportunity forecast on importance of code education. The app I’ve chosen to review is Tell a Story by Hedgehog Academy. It is an Apple app and is geared towards kids aged four to seven. The goal of the app is to teach students how to use picture clues to tell a story in order. There are three levels to the game and the hardest level was more difficult than I expected. Although the game is geared to young students, I believe my grade four students would enjoy the intermediate and difficult stages. Story writing is an important part of the elementary language arts curriculum and this app is a good example of viewing and retelling a story. The app would be even more useful in an educational setting if teachers could track the progress of students and because this isn’t possible, it would be best used in a small group setting where the teacher could monitor progress. In terms of motivation, there is a small animation to show that you have successfully completed a story, it is simple but effective. The app has a single purpose and is easy to navigate, with little help four and five year olds could easily play the game. My goal in looking for apps was to find one that was extremely simple to use, free, and motivating. I believe that Tell a Story fit the criteria well. I also needed to find an app that could work on computers and did not need a tablet or smartphone. I don’t have either and neither does my school. 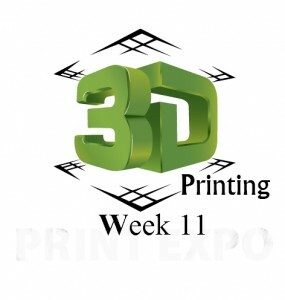 This app also fit a lot of the criteria on the Week 6 – mGBL website. It integrated well in the curriculum, it was motivating, it was simple, easy to learn, soft skills were present for young students, and finally it was the perfect price! 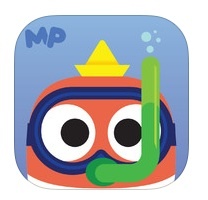 Elementary school teachers, try this app, you’ll like it. Our group narrowed our focus to code education (programming code) at the postsecondary and professional level. Our interactive OER presents the emerging market of code education, exploring both open and closed to fully illustrate the market landscape. You don’t need to understand how to code in order to understand code education’s changing nature. Please visit our OER by [clicking here]. Also, to post a review of our OER, please use the “reviews” box field located on the bottom of this page! (Apologies, replies to reviews appear to be broken in this environment, so we will reply using the same feature which will appear above these instead). 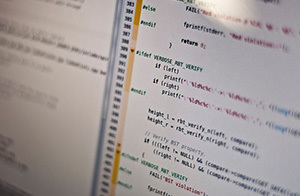 “Code” by Michael Himbeault is licensed under CC BY 2.0 Retrieved here. If you haven’t done so already, please view the video and complete the Activity #1 (part 1) poll on this page first. Everyone “should learn how to program [code! ]” – Steve Jobs (1995). 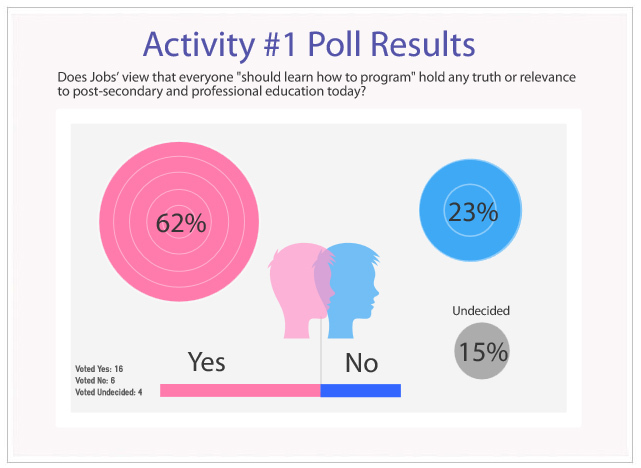 Add a comment here (using the comments box below) about your thoughts of Jobs’ view that everyone “should learn how to [code].” Do you think this view does or doesn’t hold relevance to post-secondary or professional education today (or the market itself)? Perhaps elaborate why you think so. If at all possible try to provide resources or links that help support your view (and to help add value to our OER). If you were undecided, feel free to comment instead on others’ thoughts about this, or post any unanswered questions you might have. Be sure to check back to engage in comments and questions that might be added to your responses. You can return to the relevant OER page by clicking here. 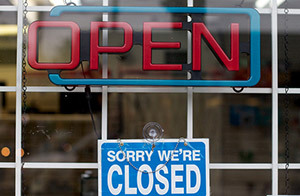 “Open Means Never Having to Say You’re Sorry” by Alan Levine is licensed under CC BY-SA 2.0 Retrieved here. Pick one resource from either “open trends” or “closed trends” and discuss it in terms of one of the options below. C ) discuss it in terms of both A or B, adding any additional insights you might have to offer. Post your response as a comment here on the bottom of this page. Be sure to include the name of the resource you chose! Feel free to contribute your own resource instead (remembering that we’re focused on post-secondary and professional code education), do indicate if it’s open/closed. Please discuss how/why you see the chosen resources as disruptive or as having a strong value proposition. Also try to provide any links/research/resources that may help us understand your perspective (we think it would be great if you could add value to our OER research). Also be sure to check back to engage in comments and questions that might be added to your responses. You can return to our OER page by clicking here. 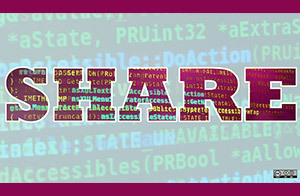 “Improving the speed and quality of research via shared algorithm implementations” by Opensource.com is licensed under CC BY-SA 2.0 Retrieved here. Please review one of the predictions [on this page]. 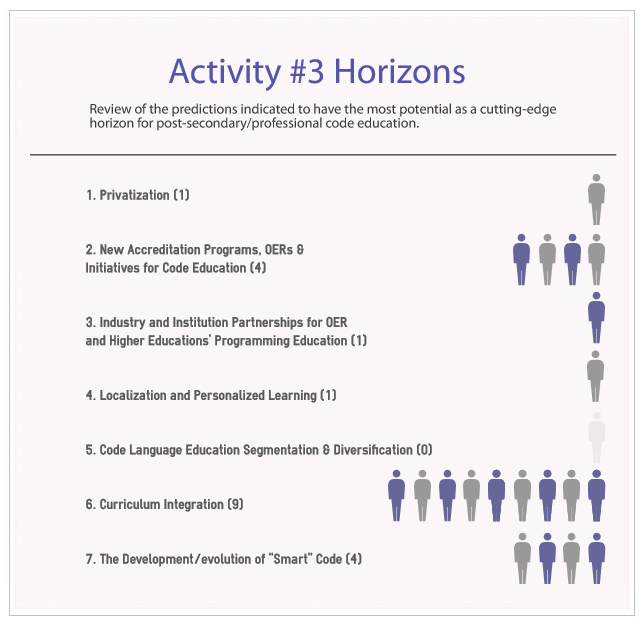 Post your review/thoughts using the reviews box on the bottom of this page discussing why your chosen prediction is a potential cutting-edge horizon for post-secondary/professional code education. Take a bit of time to do some preliminary research on your chosen topic and please add links and supporting materials wherever possible to help add value to the discussion and to help expand our OER. Also be sure to indicate the name/number of the horizon you’re reviewing. Also be sure to check back to engage in comments and questions that might be added to your responses. Middle School Math 7th Grade is a marginally entertaining game, but I doubt it would hold a 7th graders attention for very long. In this game, players guide a cute yet crudely drawn monkey (or other unlockable characters) down ladders by answering math questions. The goal is make it to the bottom of the level while collecting bananas. In order to earn a banana and progress down the ladders, the player must answer math questions correctly. Bananas can be used to unlock additional characters and backgrounds, so there is some incentive to keep going. However, these “incentives” are cheesy static backgrounds of beaches, mountains, flowers etc. The four free unlocked quizzes practice Negative numbers , Absolute Value, and Order of Operations. Unlocking additional quizzes require an in-app purchase. There are no game instructions, and one must figure out the game mechanics through trial and error. However, it’s fairly easy to pick up and play. Feedback is immediate, and there is perhaps some motivation to keep playing, as you feel somewhat compelled to post faster and faster times down the level without getting any questions wrong. The levels get progressively harder as one goes along, and there is an element of scaffolding there as well, as each successive level builds upon the last. However, it uses a linear step-by-step progression, without a storyline, varied paths, consequences, or engaging feedback. Clicking on the (?) opens up a brief text tutorial about the math concept, and a hyperlink to a Khan Academy video of said topic. The idea is for the learner to learn from the Khan video then return to the app to practice their skills. The execution seems almost like an afterthought. Unfortunately the randomly generated ladders are often positioned too close to the edge of the screen, which prevents the character from progressing down the ladder. This requires the player to back out and restart the level. This is a terrible and almost crippling flaw within the game that only the most persistent players could endure. Perhaps there is a better iOS version? It’s clear that the developers of this game put very little effort into execution of this game. It is crude, buggy, ugly, and severely lacking in its educational design. I chose to use the game Cyberchase Shape Quest! 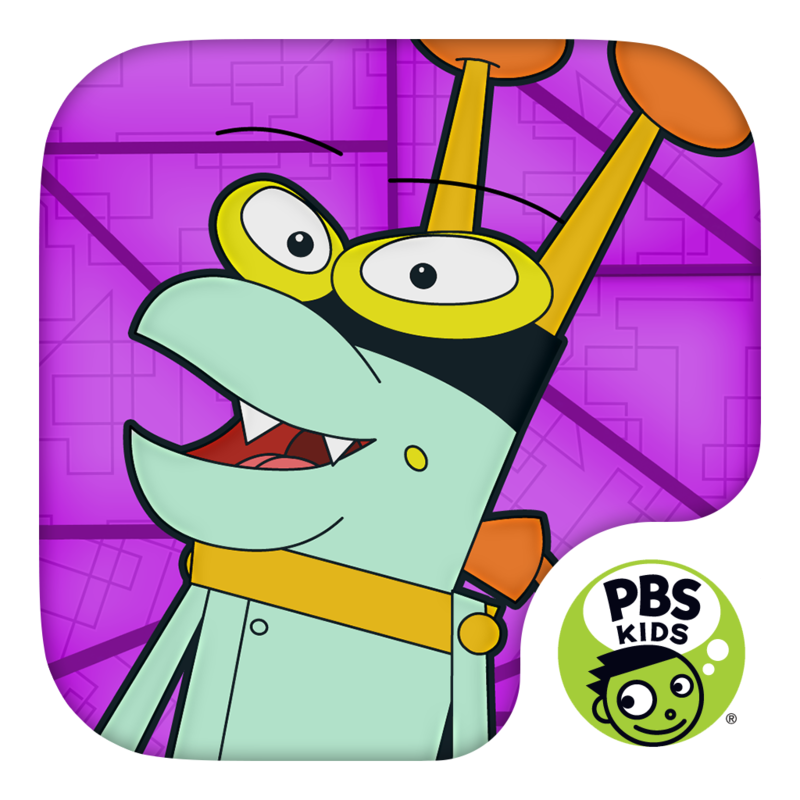 by PBS Kids. The reason I chose this game is because I wanted to use a game that was available on multiple devices. This game supports Apple IPad, Android Tablet, and Kindle tablet. At first I thought this was a wide range, but on closer look I can see that it is still exclusive to a tablet. I did download the game to my IPad after reading the 2 reviews available (one great and one said it did not work). There were 5 people who rated the game in total and it had almost 5 out of 5 stars. I can’t say for certain what the experience would be on all devices but I can speak to my experience with the IPad. The game is visually appealing with good graphics and I can see that a child would like it. It also has fun music playing in the background with lots of sound effects. One odd thing that I did not realize about the game is that there are 3 games within Shape Quest: Patch the Path, hide and Seek and Feed the Critters. For Patch the Path the user has to print off a map from the PBS website and hold the IPad up to the map. This seemed like a hassle for game users, particularly children, and I would predict that the map becomes the problem of the parent and that holding an IPad camera up to a map to play a game is perhaps more challenging than an IPad game should be. There was no tutorial, and perhaps there should have been, especially with the printed map which could be confusing for students. The other parts were fairly simple to figure out if you had played games on an IPad before. It also started simple with the games, easy levels and simple tasks. I think that students get some level of satisfaction out of the game. Each time they play an activity the pass or fail and can retry the level. Levels are unlocked when the previous level is passed and students get a rating for each level (out of 3 stars). There is a lot of visual and audio feedback for correct and incorrect moves letting the student know immediately if they are doing well. I also think that the content was well masked to be fun. While the player did have to carry our geometric tasks – for example feed the animal by using a sling shot motion to bounce the food off of walls and aim it at the animal’s mouth – it seemed more fun than geometric. The content was very educational. While I do think that young children would like this game, I think that it has a very narrow audience. It caters to young children and children learning about geometry but it certainly has the feel of a young child’s game and I think junior and intermediate students would pass on playing this game. I also did not like that it had external parts (the printable map). I like that it is available on multiple devices but it does cater to a narrow audience. Regarding this application, it seems as though the developers had a certain educational agenda, and then tailored the application to suite that need. The game clearly aims at teaching younger children about the various elements that are contained in the ocean, and how vessels navigate these waters. If the application is upgraded at a cost, a number of other puzzles and levels emerge, however I did not investigate these options. There are a number of elements that would keep children engaged with this game. Firstly, it is predicated on an ‘open-sandbox’ mentality, in which students can explore the vast expanses of the ocean at their own leisure. The game itself is driven by visual and auditory cues, which also can serve as directives for children to follow. The various colors and tactile nature of the game, would easily keep children engaged. This application does a good job at identifying the learning outcomes it wishes to achieve, and then designing activities centered around those outcomes. For example, one learning outcome is for children to expand their ocean related vocabulary. This is achieved through narrated games, which have students identify objects for which they have learned the vocabulary of. As previously stated, I believe that this game meets the learning goals it sets out to achieve, in an age appropriate way. The target demographic for this game are parents of children in lower elementary school, and so the games which are suited for this demographic, involve low level cognitive and fine-motor skills. The game is both simple and intuitive to play. The layout is clean and crisp, and the audio quality provided by the narrator is clear and articulate. The colors in the game are vivid, and so children are able to identify objects easily. Mastery of the game is easily achieved, and the levels provided in the game allow for the mastery of a diversity of skills. One of the strengths of this game is that it begins with lower cognitive skills (such as rote memorization) but then builds on these with more 21st century learning skills such as critical thinking and problem solving. The puzzles that arise in the game would help lower elementary school students not only learn about the oceans, but also understand how the oceans work and the problems facing the worlds’ oceans. The fact that this game can meet curricular standards, and then engage students in critical thinking activities, leads me to believe that it can push beyond curriculum standards. Furthermore, this game platform could be easily adapted to teach students about an infinite number of social ills. As previously mentioned, this game could be easily adapted to educate students on a variety of topics (i.e. deforestation, climate change, consumption), and this flexibility is a definite strength of the program. Considering this application is free (upgrades are available of course at a price), I would say the price was certainly right. Having read through a number of the reviews on iTunes, a number of parents have praised this game for being both educational and fun – a winning combination for any game. Fun English by Study Cat is a fun and engaging game for young English language learners (aged 3-10). Learning and play are well integrated into the framework of this game which includes a series of 10 themed lessons and over 50 games. It is clear that the educational goals (language learning) have been clearly outlined and embedded within the games of this language app. The Fun English course focuses on both vocabulary development and basic grammar concepts – which are integrated into fun themed games. Fun English does not have a continuous story line that is carried through the game. Rather, each lesson focuses on a different theme (i.e. Food, the house, the body, colours), and the games within that lesson allow players to develop a specific vocabulary set for that context. Each lesson also focuses on a different grammar concept (i.e. the verb “to be,” “adjectives,” “singular and plural”). Each lesson could stand alone, and lessons don’t necessarily need to be completed in a consecutive order, so there is not really any scaffolding happening between lessons. However, within each lesson, scaffolding occurs as each game within the lesson progressively becomes a little bit more difficult. In the lesson on “Colour,” for example, the lesson begins with games focusing on matching colours, and listening to the names of the colour while matching the colour to an image, and the games near the end of the lesson focus on the spelling of the different colours and building sentences with the colours. The game seems fairly easy to comprehend and pick up. The games do not come with instructions (written or verbal), however, and so when playing a couple of the games, it took me a few minutes to figure out the objective or “aim of the game”. 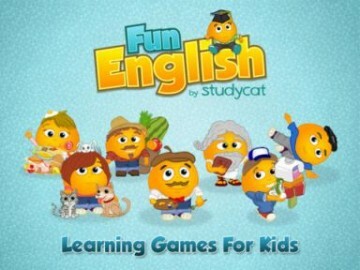 Overall, learners engage in a series of vocabulary and grammar related games to develop their English Language skills, and then receive feedback once each level is completed. There is a lot of repetition and reinforcement of the vocabulary being learned, and each game focuses on a different skill or aspect of language. The visuals and animation are fairly basic, and many of the games resemble other popular games that kids may be familiar with from other contexts. It combines language with games that allow students to develop hand eye coordination and other motor skills. In terms of 21st century skills, perhaps the process of game play and the skills necessary to navigate through this technology would qualify as “21st century skills.” This game has been designed for a primary aged audience (ages 3-10), so this game allows players to develop their motor skills, build on their ability to concentrate and remember, practice hand-eye coordination, and ultimately familiarize themselves with technology and gaming applications. Regarding price, this game costs about 12.99, or each lesson could be purchased for 1.99 from the App store. There is also a free option that gives players access to a smaller selection of games. This is a simple, yet engaging game that is appropriate for young learners in this age group. I think for a basic language game this could be useful, and fun for kids. However, this game does not go beyond the basic language development of simple vocabulary, and does not help students develop problem solving or critical thinking skills. Integration: The CandyFactory is a universal iOS app that runs on the iPad, iPod Touch, and iPhone mobile devices.Requires iOS 4.3 or later. Motivation: All the games on CandyFactory consists of three game levels that challenge students to build a stronger understanding of proper and improper fractions. The game is based around a candy manufacturing factory where students must satisfy a customer’s order for a candy bar of a particular size. Learning and Mastery: Games on CandyFactory are simple and engaging. Needs not too much explanation. Becomes challenging as one progresses to next level. It consists of three levels: Level 1 teaches proper fractions as part-whole concept. Level 2 teaches proper fractions as whole concept. Level 3 teaches proper as well as improper fractions as whole concept. A nominal score is displayed at the end of the game to show how well the student has done. Sound-based feedback and background music are provided. Review: I will this game as 4 star for the level of cognitive demand because this game is engaging students in exploring/identifying and understanding the nature of Fractions concept using complex and unpredictable ways to solve the issues at hand. The game certainly integrates learning with pay in it’s game show format, but seems perhaps a little unbalanced (more about play than learning). The game claims to be a “business English games for ESL.”Not to be overly critical, but I have a hard time seeing idioms as of critical importance in relation ESL learning for business. For me falls perhaps under edutainment. The game is intrinsically motivating with continuous challenge, has elements of surprise in the questions as well as, rewards systems, consequences, and rapid feedback. A flash game it does not have tacit feedback. The repetition is made special by the format of a popular rewards-based game show with suspenseful time limits and rewards. 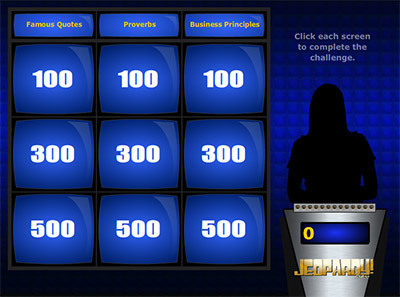 This game covers a minor topic in relation to business ESL (idioms) which are somewhat anecdotal. There isn’t much scaffolding provided to actually make these useful in different business situations, it focuses more on getting quotes themselves right. The ability to recite Nietzsche correctly at a board meeting is not necessarily going to make a business ESL student accel at his or her career goals so I’m a bit befuddled at the usefulness of the games title in relation to this. The game does think small in it’s focus and cover it fairly tightly. The cognitive format of this particular game show suits the learning of idioms rather well. The scale and complexity is manageable and useful and mastery is supported with suitable puzzles and points and there are three different levels provided (expert, advanced and novice). The system relationship between these is clear. . The game itself is simple and quick to engage with and play. Features are simple enough to not need explanation, and goals, progress, and incentives are clear. Soft skills involved are looking up and rehearsing idioms for motivation in business. As one would likely use search engines for unknown idioms this does to some degree support 21st centry skills along with critical process of elimination. These are however fairly basic skills so I can’t say they would have a large applied impact outside of the game. I don’t see this game as pushing the frontiers of knowledge or redefining new learning, rather it reinforces old practices. I see this game as lacking much iterative potential. It is not very adaptable but rather right/wrong. There are different paths enabled in a small way by the choice of which categories to approach first. This game is in my opinion more entertainment than education so it is reduced in aesthetics. Although it is free I believe it’s novelty and therefore usefulness would wear thin. I think that “open” education games (OEG?) would be a wonderful idea and resource for game players and makers alike. This would support a more iterative and innovative model of game development. It would also make better use of digital rip/mix/burn culture in order to support the three R’s mentioned! I’d give it 2 or possibly 3 stars at the most in terms of rating. Overall, I don’t see this game as a strong example for mobile game learning. It was a great example for evaluating these different properties though! It could have provided a better balance of game vs learning and also provided better scaffolding, better adaptability, and better future applicability and remix-ability. I have young children who are using many of these apps, so I used the criteria provided by team 06 and reflected on some of the apps that my 3 and 5 year old play with. Many have great songs, visuals, original ideas. Some are almost ‘digital worksheets’, which my children seem to love. 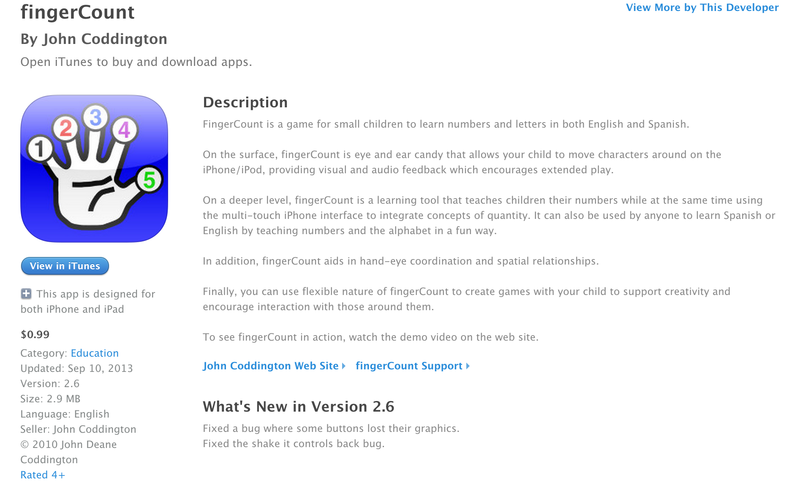 However, the app that really stands out for me after seeing it in use is this insanely simple Finger Count app. Simplicity – One of the criteria provided to use this week was to ‘think small’. I think that this game does that very well. The goal of the game is to simply count from 1-99 and back down again. The simplicity of the game keeps the focus on the learning rather than other distractions like songs and stickers. Although the learning and mastery goals may not be clearly outlined in the game, they are intuitive and easily mastered. Target Audience – This game is targeted at small children who are learning to count. The absence of background music, easter eggs, varying paths is well suited to their learning goals. Flexible – The game can be used in a number of ways. The player can simply explore, or play it, but a parent or teacher could use the platform to modify the game to suit the players needs. I noticed my son use the game for a purpose not implicit in the game. During our Christmas Advent calendar time, he would use the game to determine which square was to be opened next and whose turn it was. Cost – The full version is only $0.99. A good value for a tool that is so diverse. I would (and have) recommend this app to parents and educators of small children. A great example of how simple is sometimes the most effective. What do you think when you look at this picture? Do you know about Cloud Based Applications? If yes, How does this picture represent your understanding of cloud based apps? If no, what questions do you wonder when looking at this photograph? Follow the link below to our Weebly. We hope you enjoy working through it as much as we did making it. The New Media Consortium Report (Preview) is a short overview of projections inside the Educational Technology space. I will comment on it based on three basic questions What?, So What?, Now What?. The Entrepreneur- This report allows you to get a snapshot of what the market might look like for the next 0-5 years. If you want to start a venture or you are already in a venture, this is a very good place to start to address problems that your service or product could solve and the climate you might find yourself in while you solve them. The Educator- This report gives you insight into your classroom/school and what the classroom and the demands of those classroom will look like. After reading this, you can have informed ongoing conversations with curriculum developers, teachers, principals, and educational technologists on how to best accommodate the changing space of learning and ensuring that all players are supported in Ed Tech adoption. I think that this report would be worthwhile resource to have and refer to because of its brevity and ease of reading. I would definitely consider subscribing to this publication would suggest this reading to others interested in Ed Tech. I understand that this is currently a preview, but if it is going to be longer, I would suggest that there is an additional info graphic that displays the information as it is currently. Short and too the point. Emerging Markets Poll – Thank You! I just wanted to take a moment to appreciate your participation in the Emerging Markets Poll. I know it felt quick & you didn’t have enough time to think about or explore the ideas involved, but that’s exactly the point. As instructors we could have unilaterally decided everything that you “should” know in this course. As if we should pretend to know everything. This flash response from you is a wonderful way for David & I to recalibrate our perceptions – we always are surprised by the results, and try to learn from them. We continue to think that you may be misguided in some of your selections, but we’re humble enough to listen, and your ideas have precipitated a set of topics & teams that are excitingly original for us as well. Knowledge isn’t a popularity contest, nor is it a privilege of experts. Your input helped to shape a learning journey for all of us. A few of you haven’t completed the Emerging Markets Poll yet. It is your chance to shape the overall content of the course, and to drop yourself into a content focus you care about. Remember vote positively for the 8 most opportunistic, negatively for the 8 least opportunistic, and provide a short personal perspective on the 3 most important to you.